Ada Zanditon has just returned from successfully showing her collection in Berlin, where she wowed press and buyers with her colourful, signature prints and dramatic silhouettes. The SS14 collection 'Aqualibrium' is inspired by Zanditon's visit to two Sea Turtle conservation projects in Sri Lanka. The turtles fascinated Zanditon for their long nomadic lives and oceanic journeys, continuously adapting their existence on earth for over 100 million years, since the time of the dinosaurs. Now due to human activity, all remaining seven species of turtles are either endangered or critically endangered. The shapes, textures and colours of the prints and surface inspirations come from Zanditon's photographs and videos, from which she created drawings and watercolour paintings of the Sea Turtles and their habitats, both as newly hatchlings and as juvenile adults. There are two palettes in the collection, the monochrome palette which focuses more on contrasting textures of black and the colour palette which takes inspiration from the Sea Turtles habitats from birth to maturity, bright citrus colours, white and cream sand, lavender, lilac and marine colours from sea grass beds to coral reefs. Rather than change silhouette each season, Zanditon chooses to evolve signature shapes and silhouettes with classic items such as the Galaxia Trench making a welcome return. Other key items including the structural outerwear have evolved into sculptural biker jackets and summer weight capes. Inspiration in the collection also comes from forms of tribaldress from various island nations - Samoa, Tonga & Tuvalu. The collection is made from luxurious textiles including: organic cotton handwoven denim from India; Fairtrade organic cotton corduroy from India; Swiss woven organic cotton sateen; Newlife Ottoman weave recycled PET from Italy; silks chiffon & satin from Italy& India; veg tan leather from Italy; organic cotton digital print from India; silk digital print from India; upcycled Burberry raincoating from England; wool jersey woven in England; bamboo jersey woven in Belgium; upcycled linen. All dyeing processes are either natural, closed loop and/or azo free. The swimwear collaboration Ada Zanditon x Auria London. The swimwear is made from recycled PET woven in Italy which is sourced by Auria London. 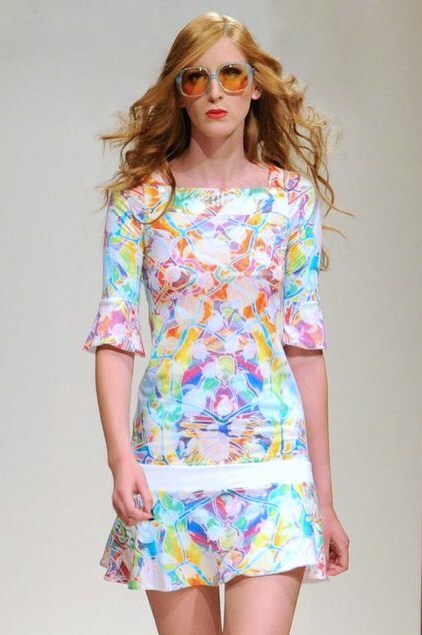 Zanditon created the prints for the range whilst Auria London designed the silhouette and detailing. Monkee Genes also have a range of jeans that are made in England. 'A Case Of' upcycled accessories by Ada Zanditon & phannatiq - any usable waste fabric from Ada Zanditon and phannatiq's studios is saved and used to create a collaborative range of unique and beautiful accessories - their signature item being a clutch bag that also functions as an ipad/tablet device case. A glimpse of her collection.